here & there class seat winner! 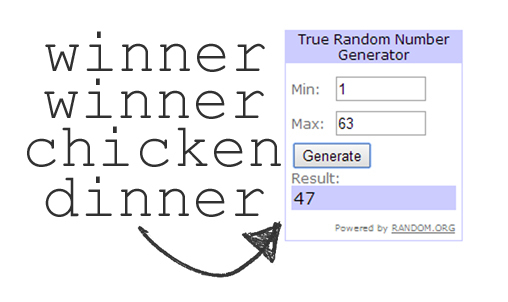 Random.org has spoken and the winner of the Here & There BPC class seat has been chosen! Thank you so so much to everyone who entered! There were 37 entries on my blog through Rafflecopter...there were 25 entries through reposts on Instagram. The Rafflecopter entries were marked #s 1-37 and the IG entries were marked #s 38-63. Then those numbers were plugged in to random.org to get the winner. Oh I am so excited! Thank you sooooo much!! !